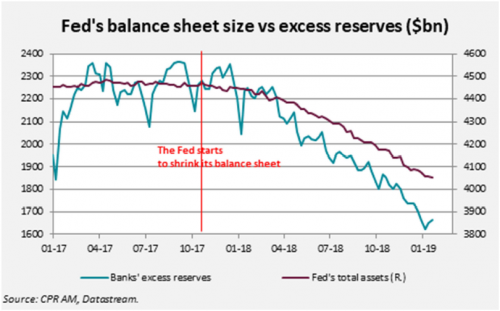 At last night’s FOMC, Jerome Powell explained that "the normalization of the size of the balance sheet would be completed sooner" and that the Fed would now "evaluate the appropriate timing for the end of balance sheet reduction”. We briefly explain why below. One of the objectives / consequences of the three QE operations (QE1, QE2 and QE3) has been to create excess reserves for banks in very large proportions. They peaked around $2800bn towards the end of QE3. 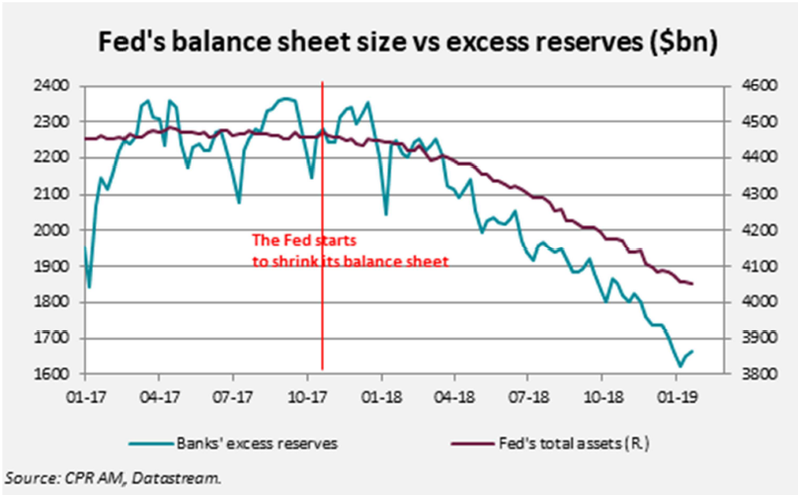 Since October 2017, the Fed has begun to reduce the size of its balance sheet (by not reinvesting a portion of the maturing Treasury securities and MBS it holds). Nonreinvestments lead to a mechanical decline in excess reserves1. The speed of balance sheet reduction has gradually increased over the quarters. Today, excess reserves have fallen to $ 1620 billion. They have even fallen faster than the reduction in the Fed’s asset holdings since October 2017. 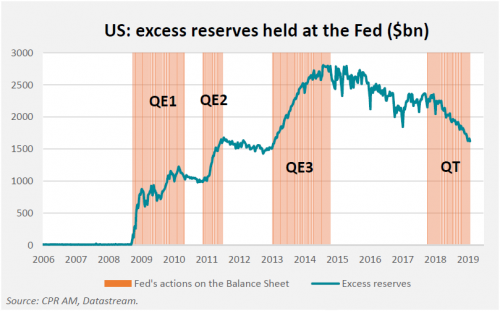 In a few weeks, the excess reserves "created" by QE3 will be completely gone. 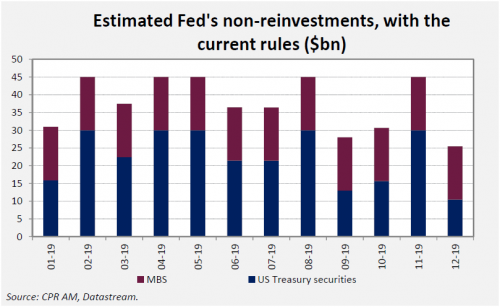 As a first approximation, with the current rules, holdings of Fed securities are expected to fall by about $450bn in 2019 and excess reserves by about as much. 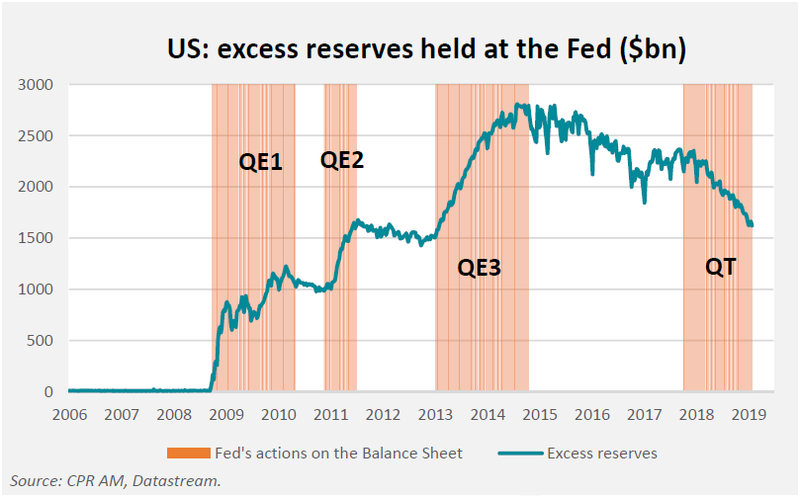 As Jerome Powell has explained during the press conference, the Fed is committed to ensuring that a substantial amount of excess reserves remains, but has not yet decided at which level it would like to stabilize them. This was already very clear in the December FOMC minutes. In the NY Fed’s survey of primary dealers (which includes major banks) before the FOMC, the primary dealers reported in December 2018 that they were anticipating excess reserves at around $1,200bn in the long-run, that is to say when the Quantitative Tightening is finished. A stop to the rate hike policy? Regarding the interest rate policy, the FOMC has withdrawn from its statement the mention of future rate increases, particularly because of the deterioration of the economic outlook. In addition, Jerome Powell refused at a press conference to specify whether the next rate move would be a rise or fall: "It’s going to be entirely on the data." Given that it is very likely that excess reserves will fall below $1200 billion by the end of the year under the current rules and that the Fed is very attentive to the banks’ requests for reserves - this has been explicitly pointed out by Jerome Powell - it is now very likely that the Fed will stop the reduction of its balance sheet this year. Combined with the pause in the rate hike policy that the Fed has just announced, it is a very positive development for risky assets.